This white bean soup uses the smooth taste of cannellini beans and mixes them with rich caramelized onions and the fresh flavor of collard greens to create a protein-packed soup that looks refreshingly alive and green! 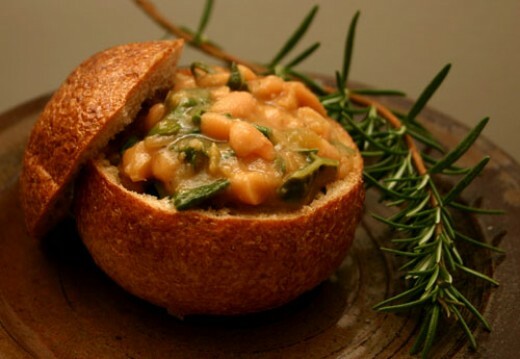 Served in a bread bowl, this soup feels like a delicacy in the cold winter months. It can be cooked in a crock-pot (slow-cooker) all day while you work, ready to greet your family in the evening. * Check the ingredients list. Acidic tomatoes wouldn’t go well in this soup, so you want a broth made from other vegetables, like onions, celery, and the like. Optional: You can soak the cannellini beans the night before if you wish to reduce the cooking time, but it isn’t necessary when using a slow cooker that you can leave on for several hours or all day. Some people say that soaking the beans makes them easier to digest, but that’s still up for debate. Do whatever works best for you! 1). Wash the celery, peel the garlic cloves, and remove the onion skin. Dice the onion, thinly chop the celery, and crush each garlic clove with the flat of the knife and then slice them thinly. Put all three into a large (gallon-sized) soup pot over medium heat (a bit below medium on a gas range). Drizzle with the olive oil and then stir frequently until the onions have turned translucent. 2). Meanwhile, sort and rinse the dried cannellini beans. 3). When the veggies in the pot have cooked enough, add the 48 ounces of non-tomato vegetable broth, the cup of white wine, the three cups of filtered water, the salt, and the bay leaves. Turn the heat up to medium-high and bring to a boil. Reduce heat a little but keep the pot at a strong simmer. Stir every few minutes, and keep it simmering for about 15 minutes. 4). Meanwhile, pre-heat your crock pot. If you will only be cooking it for a few hours, you’ll want a higher setting, if you’ll be cooking it all day, you can use a low setting. Consult your manual for cooking times. 6). When the pot has simmered long enough, carefully transfer the contents to the pre-heated crock-pot. Add the rosemary, thyme, oregano, and cayenne pepper, and stir in well. Close the lid tightly and let it cook until the beans are soft and starting to fall apart. (In my crock-pot, this took about 3 to 4 hours on high, but takes all day on low. Consult your manual, or know your own crock-pot well). 7). About a half an hour from serving time, turn your crock-pot to high if it isn’t already there. Dice up half a sweet onion, sauté it in a couple tablespoons of olive oil until caramelized, then add it plus the liquid smoke to the pot, mixing well. 8). Taste the soup, and add just a little salt, to taste. 9). Wash and chop the green chard into bite-sized pieces. Add to the soup, let it bubble for about 10 minutes until the chard it cooked but still bright green. 10). Serve with freshly ground black pepper to taste, with a side of hearty bread, like sourdough. A bread bowl is an excellent way to eat this soup. Enjoy!